and again. It can get so bad that you feel that what you’re doing isn’t blocking but simply getting extra jumping practice. If that sounds familiar, believe it or not, there is hope. While it’s true that blocking is somewhat helped by height, arm length and vertical leap, technique and smarts also play a big role. One key to successful blocking is to build a solid barrier that extends over the net – even if it just means getting your hands across the net. As you reach over, there should be as little space as possible between your arms and the top of the net. If you can create a tight ‘seal’ with the net without touching it, you’ll make it impossible (or almost) for the hitter to bang a ball off your hands and force it to dribble down your body on your side of the net. To create a seal, remember to achieve full extension of your arms (elbows locked, shoulders shrugged, head down with eyes up) and reach over the net as fast as you can. Even if you only get your wrists and hands over the net, its better to create a seal than to make your hands a flat up-and-down wall. Think ‘shield’, not ‘weapon’. While technically a block is a defensive weapon, it helps to think of the blocking action as a shield or a force field against a hitter, not an offensive maneuver. Many people try to attack the ball when they block, slapping at their opponent’s hit as it crosses the net. This can produce an undesirable result: it unseals the top of the net; it’s a low-percentage opportunity because you have to time your slap exactly right to reject your opponent’s hit; you can’t guide the ball where you want it upon contact; and it’s very difficult for your teammates to line up for defense behind you. So, instead, think of yourself as an impenetrable wall or force field. You’re an immovable object set in place to repel the force of the ball. Extend far over the net, hold that block as long as possible, and try to line yourself up so the ball rebounds off your ‘wall’. Different players have different preferences about how wide they’ll spread their arms during a block. This also varies from a single block to a double block. In a double, the width is generally less than with a single block. Assuming you’re solo blocking, keep your hands about a ball-width apart, with your fingers spread and rigid to create the most surface area. Your thumbs should not touch. If they do, your hands are TOO close together. A comfortable distance might be four to six inches between your thumbs if you have small hands, and a little wider if you have big hands. If your hands are too close together, you’re not taking away enough space from your opponent. If your hands are too far apart, you’re inviting your opponent to score a field goal by blasting the ball through the opening. Ouch! This is a matter of adjustment, and it’s often helpful to ask your coach or teammates for feedback on your positioning. Always get feedback from your coach, he/she wants you to ask! Many blockers make the mistake of watching only the hitter, but the set can tell you much more about what kind of attack is coming. Is the ball far off the net? That means the hitter probably can’t hit straight down and will have a slightly slower/delayed approach, since he’ll most likely have to adjust his footwork. This means you need to begin your block jump a bit later and reach high. Is the set close to the net? By all means, make sure you get maximum penetration. A low set? Get ready to jump sooner. Naturally, the hitter can also give you information. Watch the angle of his approach. This can tell you where to line up as he begins his hitting motions. Watch his shoulder and upper body. Is there a lot of rotation? He may be preparing to hit across his body. Does his shoulder or elbow drop? A shot might be coming. Learning to read these clues can make your blocking decision a whole lot easier. Final thoughts. Sometimes, no matter what you do, there will be a hitter who seems unblockable. If you’re facing a 6-9 hitter and you’re 5-8, it’s possible that despite your best intentions, form, and attention to detail, he’ll still hit over you. But the tips above should help you match up better for most game situations. 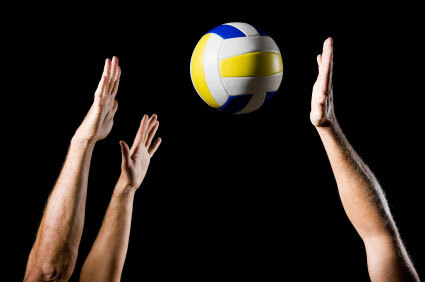 Enjoy the volleyball tips and best of luck this season to all our sponsored Universities and Club Teams. Mark Vona – GM Springbak, Inc.